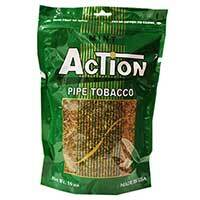 Quality tobacco in every flavor is what Action Pipe Tobacco is all about! It’s a great choice if you value quality over everything else since Action Pipe Tobacco is made using leaves that have been carefully selected to be part of their blend. Action Pipe Tobacco is the true definition of what Virginia and Burley tobacco blends should be. Strong and rich is what Action Pipe Tobacco is all about! 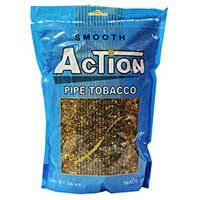 If you want something fresh and pure, then Action Pipe Tobacco should be your go-to choice. Filled with non-aromatic goodness, their premium tobacco offerings provide smokers with a delightful experience. You’ll get a slow, satisfying burn right from start to finish. No harsh finish here! 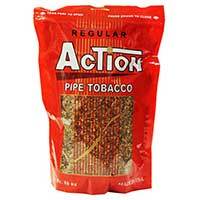 Action Pipe Tobacco has also perfected the art of freshness preservation, which results in amazing tobacco in each and every bag you buy. Plus, you’ll notice how each tobacco leaf is sized evenly and are practically all the same in texture, which just goes to show how much they care about providing quality tobacco products for smokers. Premium quality tobacco grown on stateside plantations is why many love Action Pipe Tobacco. You’ll love all their flavors, which provide enthusiasts with various smoking experiences. Looking for Action Filtered Cigars?